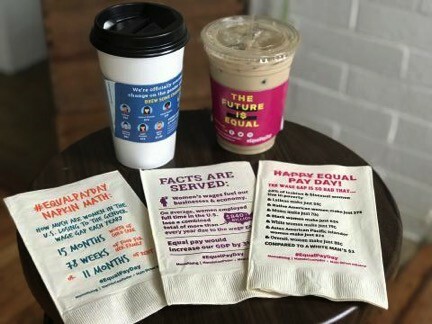 Equal Pay Day at Your Local Coffee Shop! It’s Equal Pay Day, America. That’s the day when women’s wages finally catch up with what men were paid in the previous year. How much more, you ask, did men receive? $840 billion. That’s a lot of lattes. Each year, the average woman would be able to afford 15 more months of child care, or 78 more weeks of food for her family. Women of color and LGBTQ women are hit hardest by this wage gap, so these disparities in access to resources are even greater for them. Women’s wages fuel our businesses, economy, and most importantly – many working families. This disparity not only hurts their purchasing power and upward mobility; it also hurts our economy. If women had pay parity, our entire GDP would go up by 3 percent. This is in no small part because when women – who are the primary consumers in the consumer-fueled economy – don’t have funds to spend at local business, in our communities, then the entire economy suffers too. Small businesses suffer the economic consequences of wage inequality along with their employees and customers. Moms bring home just 71 cents to a dad’s dollar. And it’s nothing short of outrageous that right now, Latinas earn only 54 cents, Black women 63 cents, and Native American women 57 cents. Some subgroups take home as little as 49 cents to a man’s dollar. Businesses are starting to see the writing on the wall. Starbucks has announced its commitment to 100 percent gender and racial pay equity, and they offer tips for other corporations to reach pay parity too. And this Equal Pay Day, April 10th, over thirty independent coffee shops and other small businesses have partnered with MomsRising and the Main Street Alliance to serve custom coffee sleeves and napkins featuring statistics, facts, and ways to take action on the gender wage gap that costs women, and our economy, over $800 billion each year. In Seattle, There’s a special free and family-friendly event at the Hill City Tap House to help celebrate Washington State’s recent passing of the Equal Pay Opportunity Act and to help build MOMentum on future equal pay laws. 38 additional states are considering equal pay legislation this year that will advance pay transparency and protect workers from retaliation. But you don’t have to be in Seattle to join in the fun – check out the list below to find and event near you, in rural and urban communities from Maine to Oregon and plenty of spots in between. 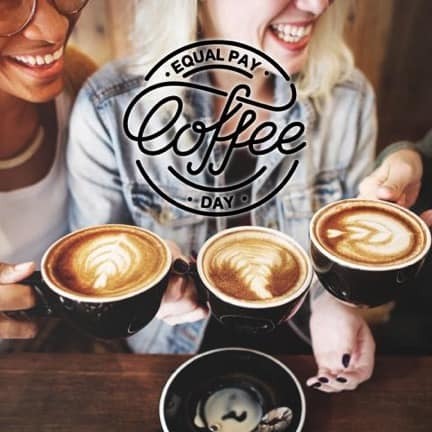 So on this Equal Pay Day, April 10th, sit and sip a latte with your friends and family. As you do, take a moment to reflect on these wage gap numbers, and join us as we commit to stamping out unintentional wage gaps, talking about equal pay, and working for everyone to get a fair shake. We can close the wage gap, together! Sara Alcid is a feminist political organizer based in Washington, DC and Associate Campaign Director for MomsRising.